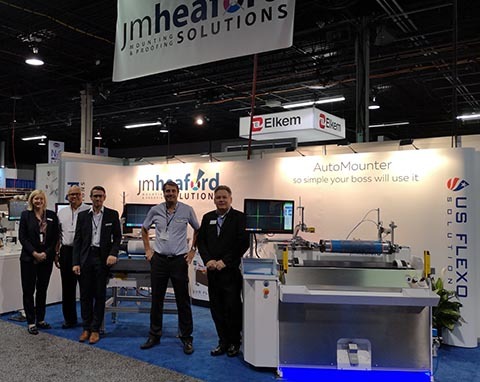 Manchester, UK – For JM Heaford, the decision to take three mounting machines to Labelexpo was a clear success that resulted in all three being sold off the booth during the show. Chosen to demonstrate that efficiency and productivity gains are available for any size or scale of operation, the mounters drew a record number of visitors to the booth leading to sales to the USA, Canada, Colombia and Mexico since the show. Left to right, Sally-Anne Heaford, Gary Zima, David Muncaster, Nick Vindel, and Gregg Gayle of US Flexo Solutions.